So let’s start with what’s on the top of the cubes! 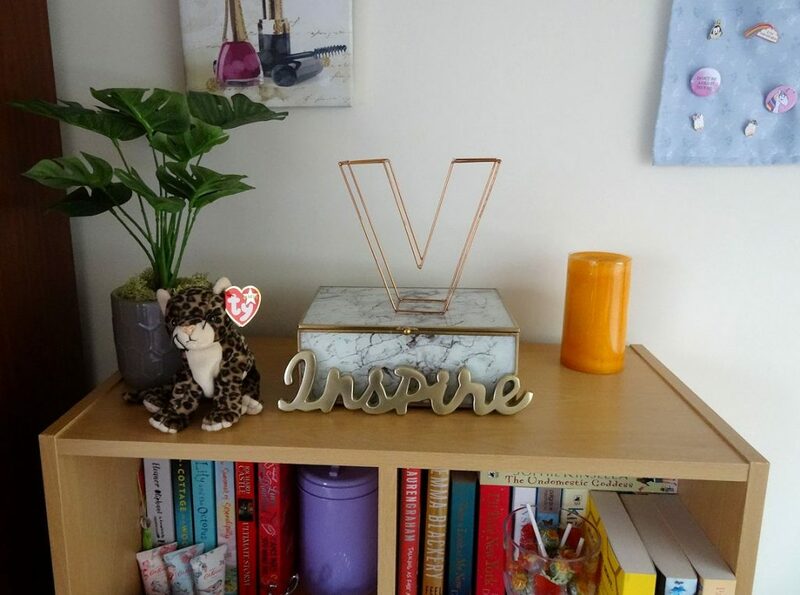 There’s the marble effect trinket box from M&S with the Inspire sign by Zoella in front of it, a candle (that’s never lit, it’s just there for decoration purposes – I’m not actually sure where this one is from), plus the letter V from Hobbycraft, an artificial cheese plant from M&S, this was a recent addition this year. 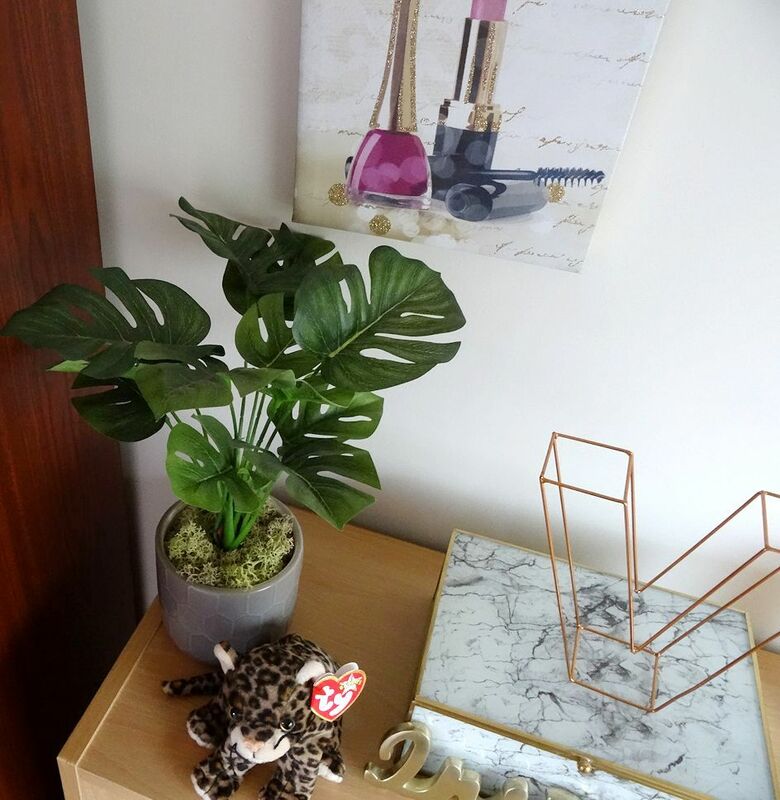 How cool is it though, I really wanted a real one but apparently they can grow really big and we don’t really have the space for one right now so I decided to get this one for my room. Then there’s the leopard TY Beanie Baby that I recently got out again as a bit of a throwback, this one is called Sneaky. 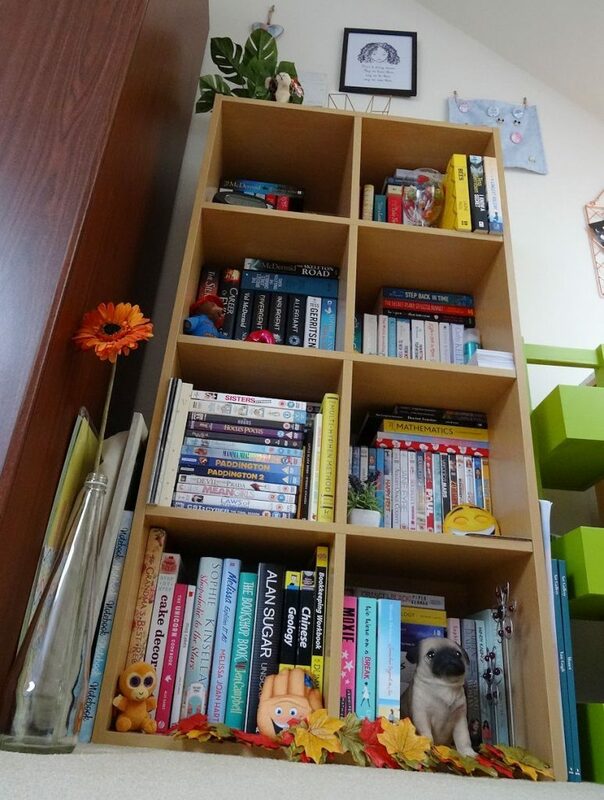 Along with the many books, DVDs and various other things on the cubes, there’s the Paddington Bear soft toy I bought from the Paddington Bear shop on Paddington station a few years ago, some The Emoji Movie McDonald’s toys, an artificial lavender plant, a pink elephant from Paignton Zoo, the pile of cards on the right of the second lot of cubes down is the mini inspirational cards from TreatBox, there’s also a glass full of Chupa Chups lollies, I hadn’t had a lolly in years then I kept seeing them on NCIS and it made me want to get some again! Compared to the other cubes there’s more non-fiction books on these two cubes at the bottom, plus there’s the autumn leaf garland I made a couple of weeks ago from artificial leaves I got from The Works earlier this year. That is everything. Isn’t it typical though that by the time I’ve got round to posting this I’m like ooh let’s change things around on there now haha! Thanks Kat, with the trinket box it was definitely one of those the instant I saw it I knew I wanted to have it moments. Your shelves are so neat! I don’t think any of my shelves are this neat and tidy! Thanks Pippa, to be honest they aren’t always quite this tidy. I can spot some great books on there! Thanks for sharing ? Ooh which ones are your faves? Thanks Elle! 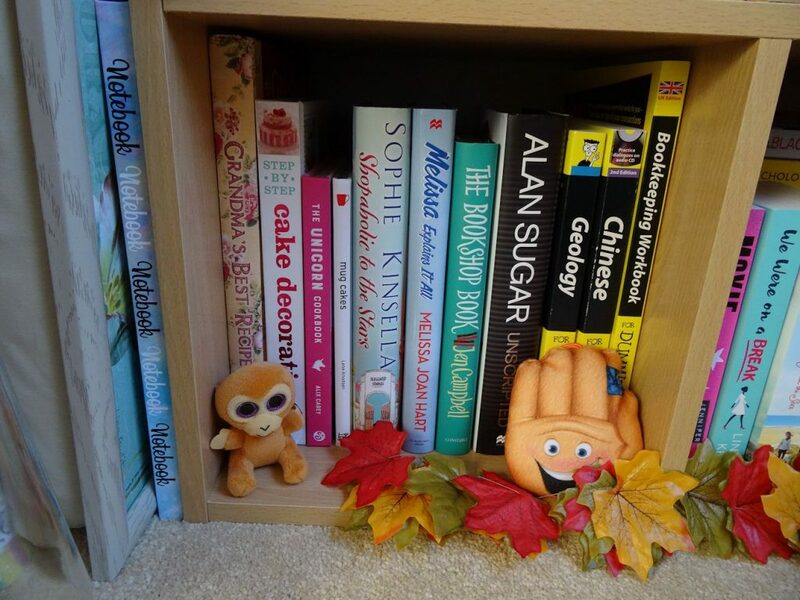 I love all of the little personal touches you’ve put on your shelves. 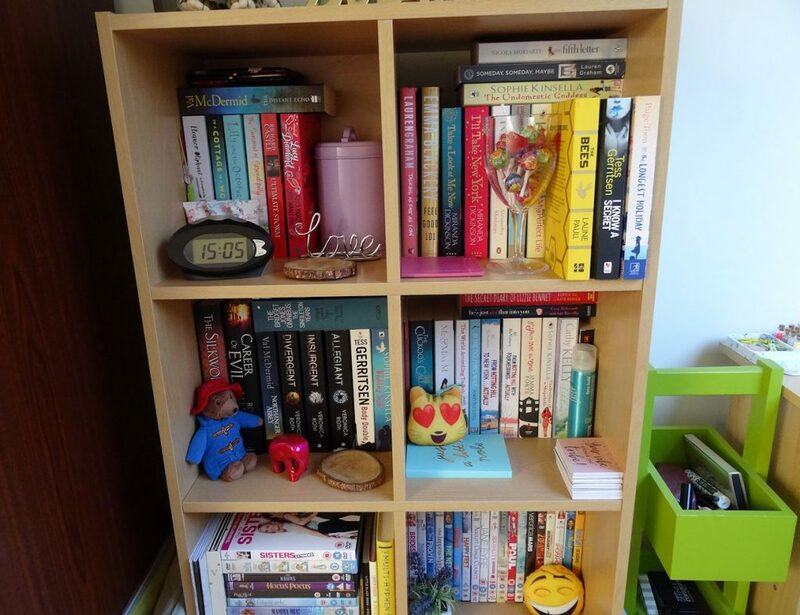 I am also a fan of posts like this, just because I love seeing what everyone has on their shelves, even if it does lead me to add more onto my ever growing TBR, haha. 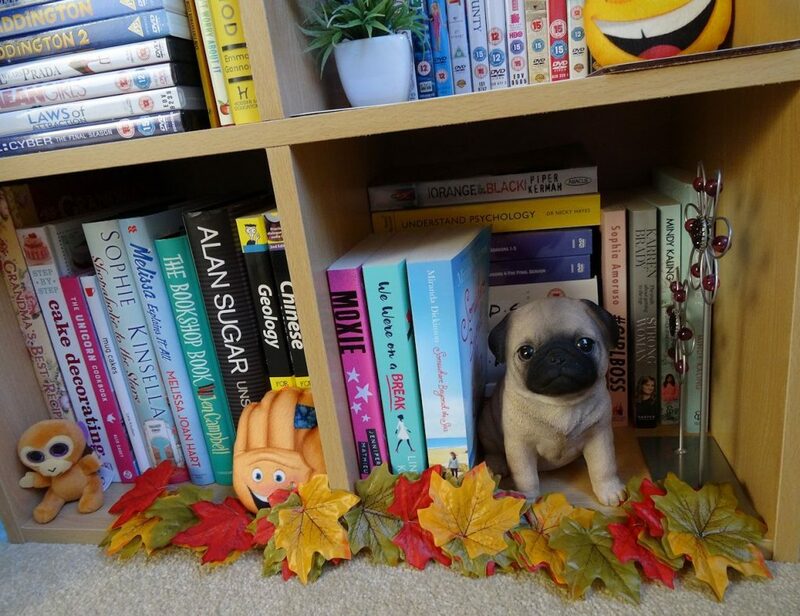 My TBR list keeps increasing too every time I see book related posts! I literally will need to get a new bookcase at this rate. Thanks Sarah!